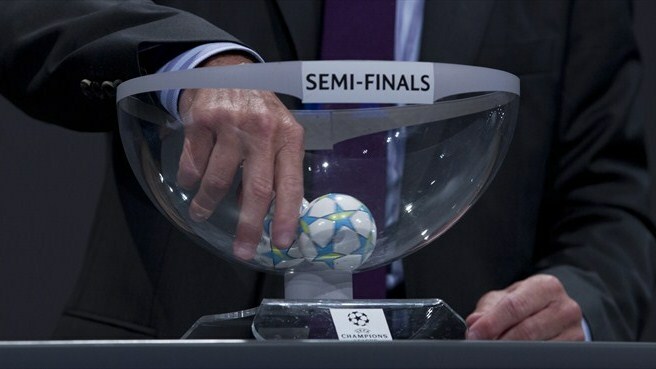 Bayern, Baraca, Juventus and Real Madrid awaits UEFA Champions League draw.The draws for the semi-finals of the UEFA Champions League will take place at Uefa headquarters in Nyon, Switzerland on Sunday.The sides drawn first will play the first leg at home on 5/6 and the second leg away on 13/12 May. Final battle will take place at Olympiastadion Berlin on Saturday 6 June 2015. Pep Guardiola could face his old club for the first time since leaving in 2012. Fc Barcelona had won three La Liga titles and two Champions League crowns with Pep Guardiola. Toni Kroos will play against his former club for the first time since his arrival to the Bernabeu. Madrid will be more than wary of Bayern forward Robert Lewandowski, who smashed four goals past them for Borussia Dortmund in the 2012/13 semi-finals. The former Liverpool Suarez would also come face-to-face with Italy international Giorgio Chiellini and Patrice Evra. Suarez has long dispute with both of them and was banned for eight matches during the 2011/12 Premier League campaign after being found guilty of racially abusing former Manchester United defender Patrice Evra. Also face 4 month ban for biting Giorgio Chiellini in FIFA World Cup 2014. Spanish rivals will have another El Clasico in the UEFA Champions League if they meet in semis. If the two sides do avoid one another in Friday’s draw, there will be possibility for the first ever El Clasico Champions League final. Juventus have lost only once at home in all competitions this season and could provide a significant threat to ending Real’s chances of back-to-back European titles. While Madrid try to overcome Juventus home record, to retain the UEFA Champions League. Juventus try to win their first European crown since 1996. They have failed to overcome the German giants in their previous four meetings. I¡¦m no longer positive the place you are getting your info, but good topic. I needs to spend some time learning much more or understanding more. Thank you for excellent information I used to be looking for this info for my mission. Everyone has some business acquiantance that can help others to do successful business.How to let all of them know each oteeu.Brsinhss acquitantance service may do it.Big business service ? Profitbale business service ? Let me know. Great thanks.